This 16th century icon is a part of a celebrated set of festal icons showing important events in the life of Jesus plus a few other renowned feasts of the year. It was painted by George the Cretan for the Holy Monastery of Dionysiou on Mount Athos, and together they are known to be great examples of Post-Byzantine Greek iconographic art. This icon is the second of that set of icons. 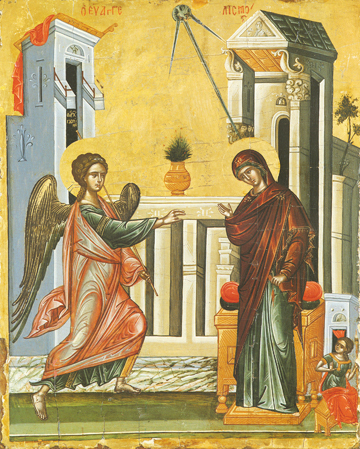 The Annunciation of the Theotokos was a most special event in Sacred History, for on this day, after the Virgin agreed to be the Mother of God yet remain a Virgin (a Mystery that cannot be solved by human understanding), God entered the world through His Incarnation in her womb, bringing life and hope to the world. The Virgin is seen here speaking with the Archangel as he greets her with these words, “Rejoice!” She responds by giving her full cooperation in obedience to God’s plan, undoing the disobedience of the first Eve who tasted the forbidden fruit of the Tree of Knowledge before she was ready through humility and meekness. Thus the Virgin is called the Second Eve, the Mother of all those living a Heavenly life in God through her Son, Jesus Christ.